Now that you've learned a bit about how your muscles fatigue, let's quantify it to further your learning in a competitive way! In this experiment, you will learn about and compare the rate of muscle fatigue between different people and muscle groups. You will also learn how to make a mathematical model of fatigue. EMGs during Muscle Fatigue - You should read our first fatigue experiment to learn about how to use the Muscle SpikerBox and muscle physiology. From our previous experiments we learned a bit about why muscles fatigue and how to view this process in realtime using the Muscle SpikerBox. That was the beginning. Now we will explore variation in the rate in which people's muscles fatigue and model it. Any good scientist should learn how to quantify their experiments, and that's what we do here. Age, gender, body-type, and lifestyle all play important roles in how your body's muscles have developed and, subsequently, how much effort they can exert before fatiguing. Before diving into the experiment, let's learn a bit more about different kinds of muscle fatigue that you may encounter in life and science! You can think of Central Fatigue as "mental" fatigue, also called CNS-fatigue (Central Nervous System). This type of fatigue is associated primarily with a reduction in neural drive or motivation. Giving up on a movement could be a protective measure that the body employs to avoid sustaining any damage that could occur if you continued that sustained intensity. 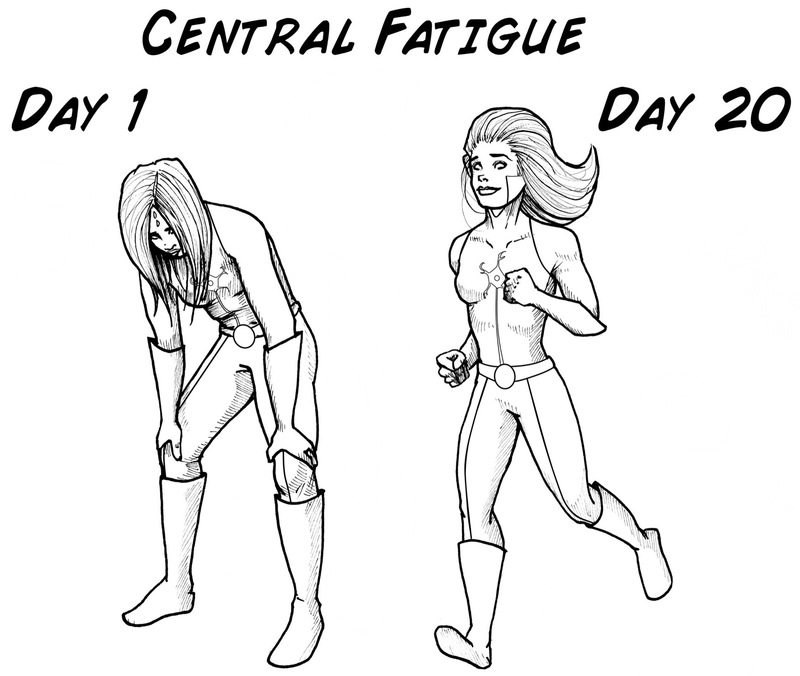 Central fatigue is something that can be largely "trained away," and it affects novice athletes who are performing activities they do not have a lot of experience with. Distance running is an example of how central fatigue can differentiate a novice from a professional: a novice, who is not used to exertion for an extended period of time, is going to have a very difficult time running any significant distance. Without previous training, the novice will likely stop well before their muscles would have given out. Have you ever thought to yourself, "I could probably run much further, but I just don't waaannnnaaa?" An olympic distance runner, however, does not meet that same "mental" block and will continue to run through the discomfort. This is the most purely muscle physiology variation of fatigue. 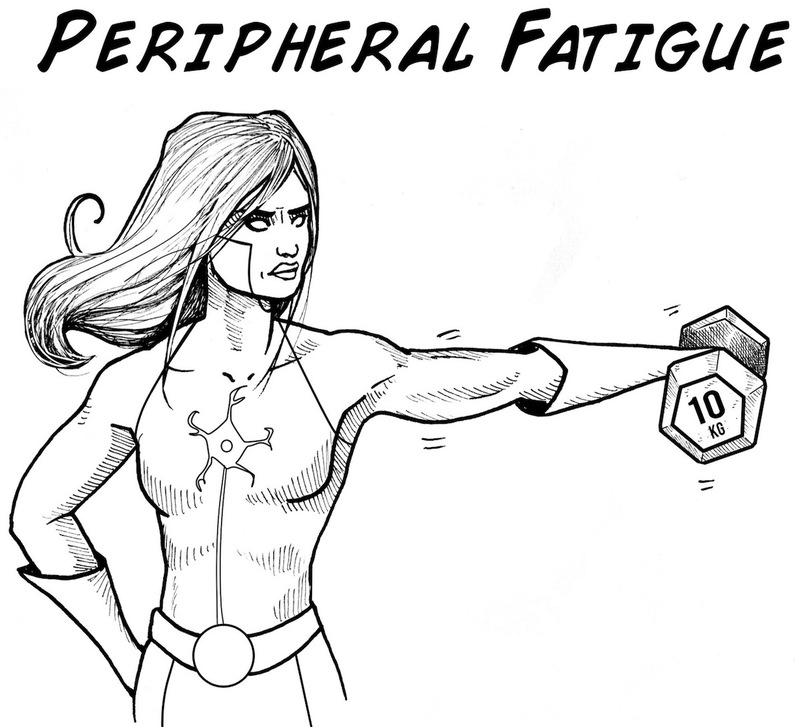 Peripheral fatigue occurs when you simply cannot supply enough energy to the muscles to keep them active. If you remember back to the previous experiment where we learned about "orderly recruitment," a motor unit experiencing fatigue is replaced by a new motor unit. 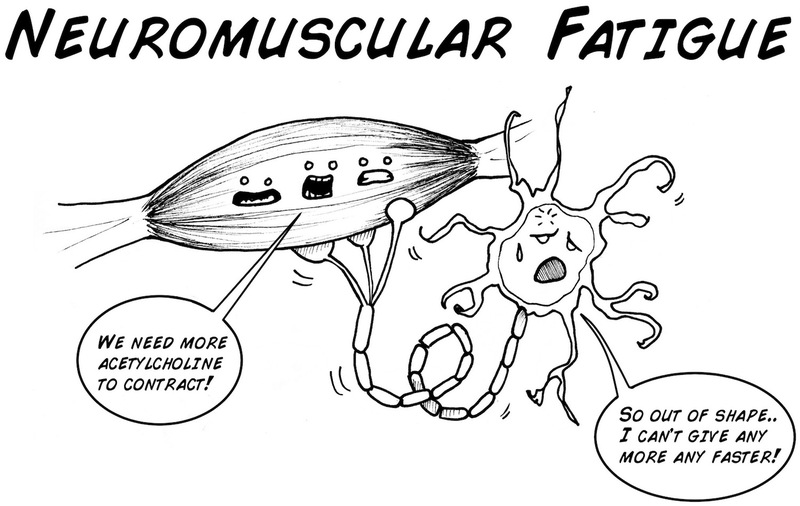 Eventually there are no fresh motor units available, and this is peripheral fatigue. When examining an electromyogram (EMG) recording of this fatigue, it is common to see a decreasing trend in EMG amplitude, but with bursts of renewed intensity at points within the recording. These are the moments when other motor units are jumping in to attempt to maintain the same amount of intensity. This fatigue is what you most commonly experience when you're pumping iron at the gym, loading logs onto your truck, or other short bursts of intense exercise. Also called nervous fatigue, this is a much less frequently observed fatigue that is a result of nerves being unable to fire enough to maintain a muscular movement. If a nerve cannot maintain a high intensity spiking signal, secreting neurotransmitters constantly, it experiences "synaptic fatigue," where the nerve is no longer able to stimulate the muscle fibers it innervates. With exercise, this is only an issue at extreme levels of muscular activation and intensity. Similarly to Central Fatigue, Neuromuscular Fatigue can be addressed with adequate training over time. What makes this fatigue different is that it can also be a symptom of disease. In this experiment we will be observing primarily peripheral and a bit of central fatigue, but we will not likely be observing neuromuscular fatigue. Take notes during your experiments and try to figure out what kind of fatigue you are witnessing! Trend lines are used to investigate relationships between variables. By solving an equation for slope, we can build a trend line, which will give us a "model" of our muscular fatigue over time. But what are we measuring? What is our x-axis, what is our y-axis? HWe will get there, hold on. Since we are interesting in fatigue, which can be thought of as muscular performance over time, we will have the x-axis be precisely that -- time. And our y-axis? Why, it will be the amplitude of our EMG! which is a good corollary for the amount of force we are generating. But, we are going to do an operation on the amplitude of the signal. 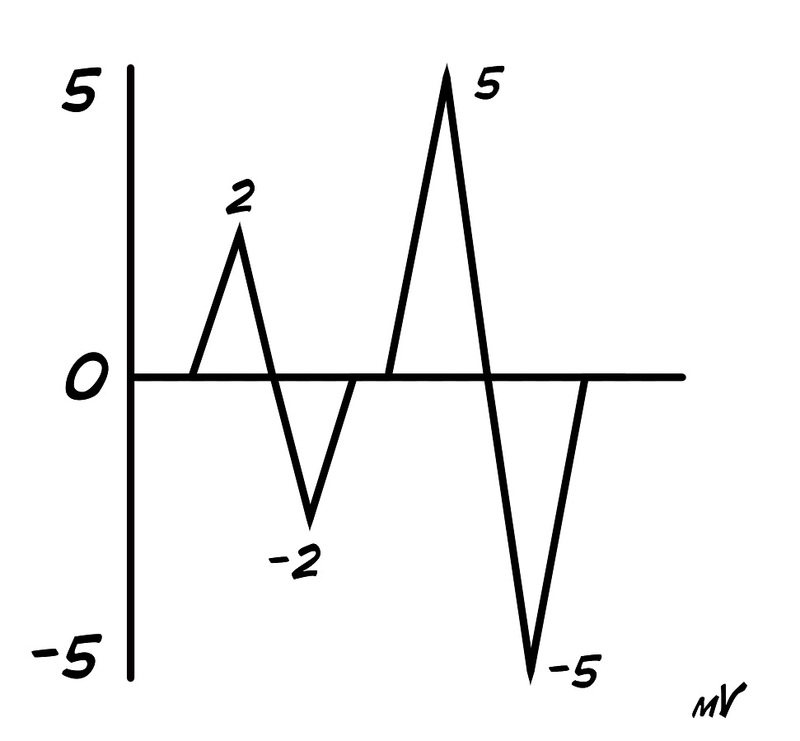 Instead of using strict amplitude, we will use the RMS (root mean squared) which is a conversion of the amplitude. We will then measure the RMS over time. Let's take a quick look at RMS before we go any further, just so we understand what we're working with. RMS is not a measure of peak signal strength, rather it is a measure of general signal strength, which is calculated by squaring the signal, taking an average of the sum of squares, and then taking the square root. Seems mathemetically excessive and unnecesary, so why do scientists even do this? That covers the square, but what about Root and Mean? Root and mean go hand in hand together here. Now we take the "sum of the squares" of the signal and divide it by the number of samples we took to get our mean (or average) value. Then you take the square root of your mean value to come up with the RMS! The first step of our experiment will be choosing your independent variable. For this experiment, you may be interested in comparing young versus old subjects, boys versus girls, or maybe you want to compare people who have a high-weight max bench press versus a low-weight max. For our example, we will be measuring the difference between three men and three women, all within a few years of the same age. 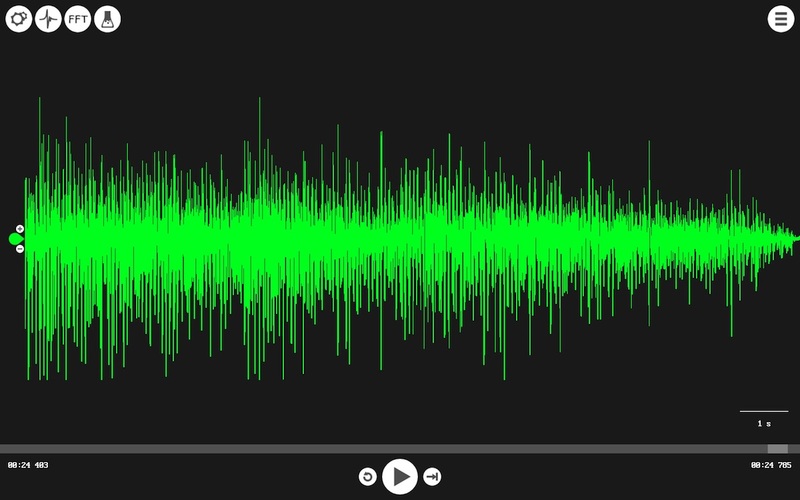 Before you begin, make sure you have the Backyard Brains Spike Recorder installed on your computer/smartphone/tablet. 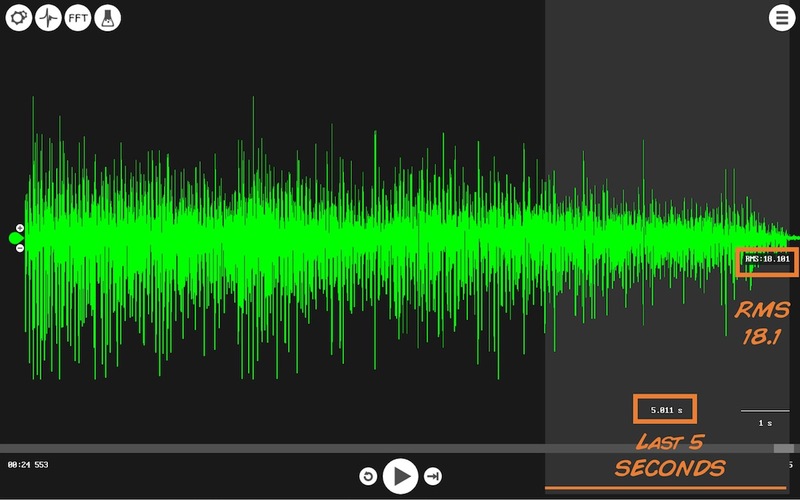 The Backyard Brains Spike Recorder program allows you to visualize and save the data on your computer when doing experiments. We have also built a simple lab handout to help you tabulate your data. Before you hook up a subject you have a couple of decisions to make: What muscle are you going to record from and what kind of activity are you going to have the subject perform? We prefer "isometric" contractions, where you are contracting but the body is not moving. Our favorites are the bicep lift (which uses the ...biceps), the deltoid lift (which uses the ...deltoid), and the lateral row (which uses the latissimus dorsi). The lateral row may require a visit to your school gymnasium, which is a good excuse to get your pump on after you do your experiments. Decide which muscles you want to record from and apply the muscle electrodes in the usual manner. First, connect your subject to the Muscle SpikerBox and your Muscle Spikerbox to 1) your computer using a USB or laptop cable or 2) to smartphone/tablet using the green smartphone cable. Begin by testing your signal: have your subject flex a few times and watch your display to see the spikes. 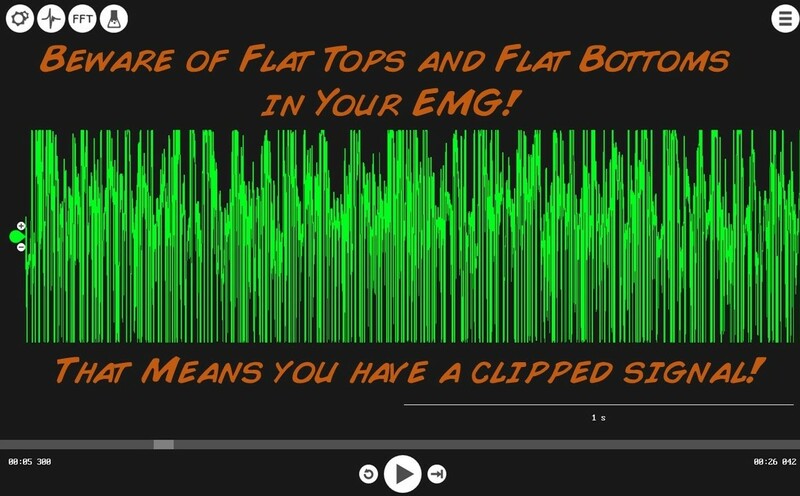 Turn down the "volume" wheel (gain of the signal) until you can see the tops and bottoms of all the spikes. Once you can, have your subject relax a couple of minutes. Note, this is only an issue if you have our normal Muscle SpikerBox. If you have our new Muscle SpikerBox Pro, you do not have to worry about gain clipping, the circuit won't let you! Choose a weight load that the subject is comfortable maintaining between 15-120 seconds before load fatigue is too high. Instruct the subject to keep the muscle active for as long as they can, even as they feel themselves getting "weaker." Write down the length of time the subject was contracting as shown by the EMG, and save the recording with identifiable notation, such as "Muscle Fatigue - Woman 1 - total time 118s." Perform this with as many subjects as you can. The more values, the more compelling the results! If you are in a classroom, get everyone involved! Quick Note: Do not change the gain while you are doing a recording, as this will affect your RMS values and the measurement of fatigue rates. Our first step in interpreting our data is to turn our recordings into something quantifiable. With your right mouse button (or double tap on tablet), click and drag from the beginning of the signal until you have selected a five second sample. Look at the RMS value displayed on the screen and write it down. Now repeat for the last five seconds of the signal, just before the subject relaxed. Write down the RMS value. 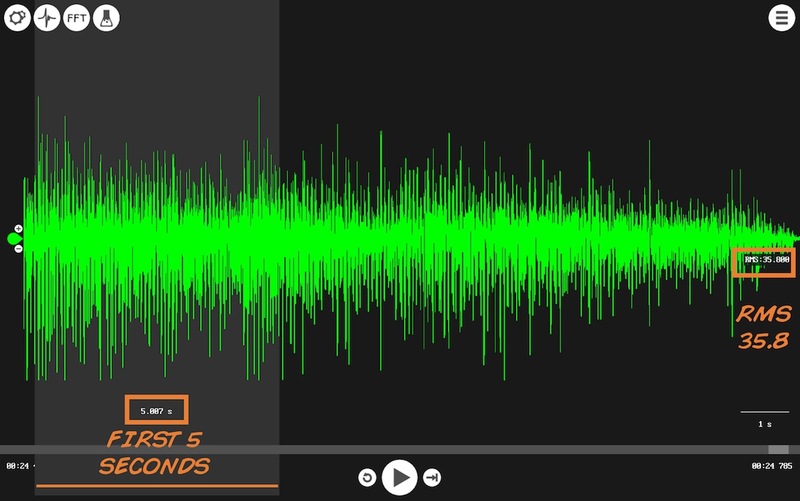 For each recording you thus have three measurements 1) total time in seconds - Total Time(s), 2) RMS of the first five seconds - RMS Begin, and 3) RMS of the last five seconds - RMS End. Repeat the process until you have collected the data for all your subjects. 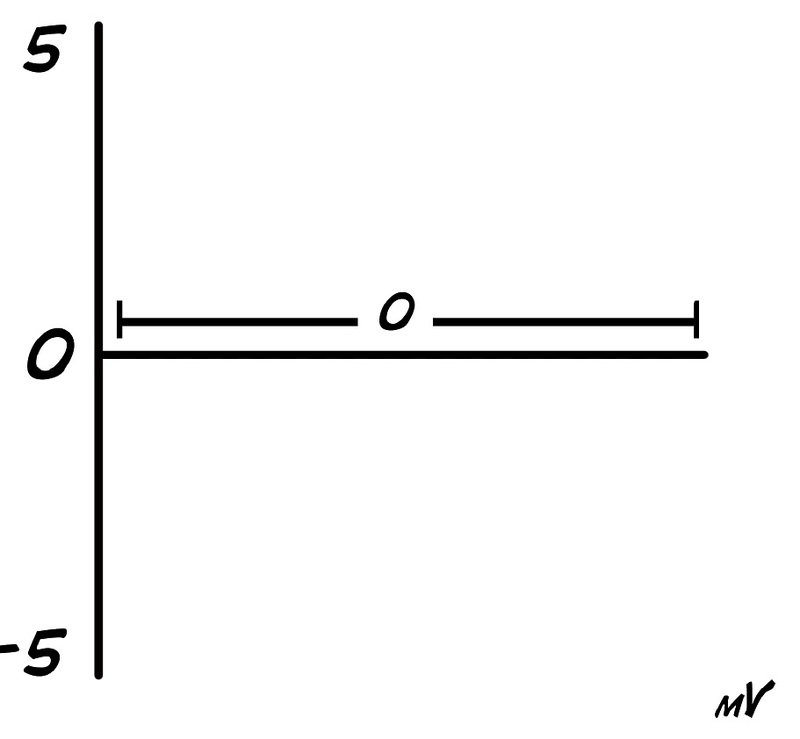 This is the formula for our trend line, where "m"" is equal to our slope (rate of fatigue), and where "b" represents where the line would intersect with the y-axis. 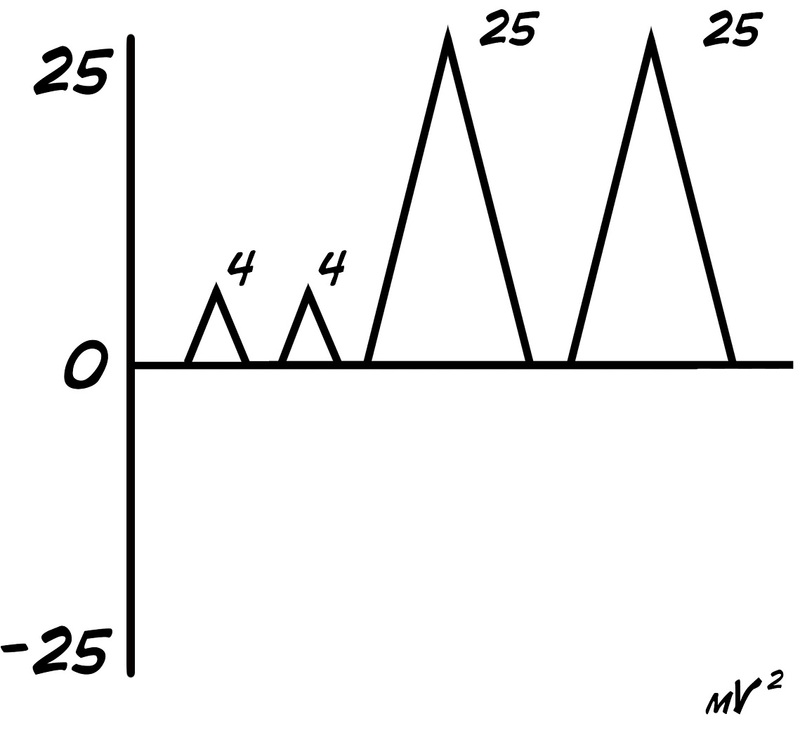 "m" is the slope of our trend line that we're calculating for the fatigue signal. We have to take into consideration that our RMS measurements are themselves an average over five seconds. 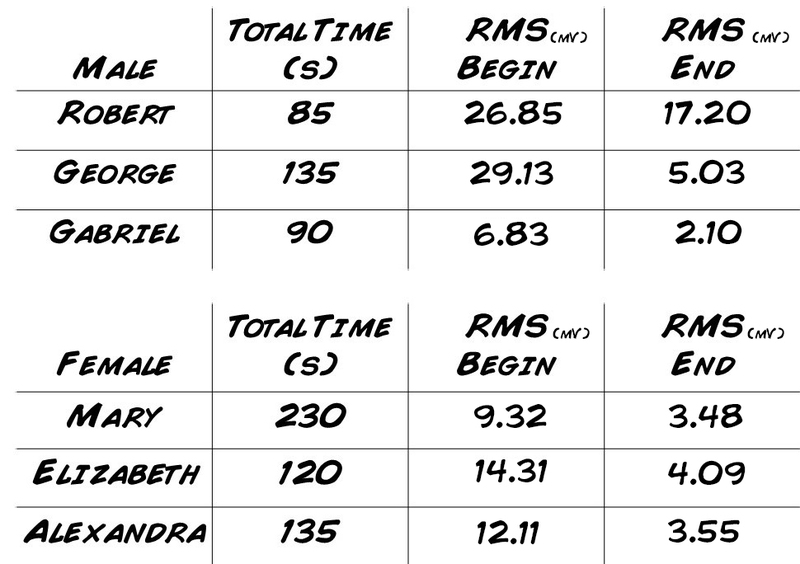 To account for this and have our RMS expressed in units of seconds, we will divide our RMS measurements by 5. Now let us consider the case of Robert. His initial RMS was 537 and decreased to 344 over 85 seconds. Time is our x variable and RMS is our y variable. We can solve for the rate of fatigue by plugging into the formula for the slope above. Since our experiment started at time = 0, 0 will be the second x variable. This is Robert's rate of fatigue and what we are principally concerned with. We can go full circle here and practice calculating the trend line, or line of best fit. 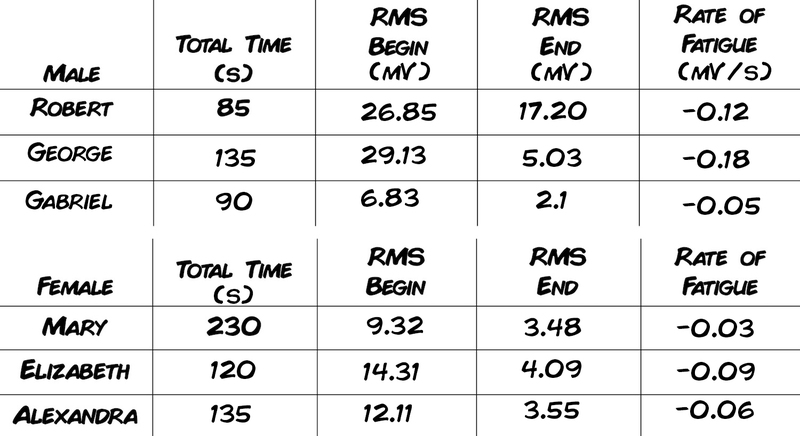 In our case it is easy, as we already know the b (y-intercept) value, since have we have the RMS value for time = 0. This formula represents the trend line for the first test subject's EMG signal during the fatigue test. Now calculate the slope, or rate of fatigue, for all your subjects. What will the data reveal? Let's try to understand our results. 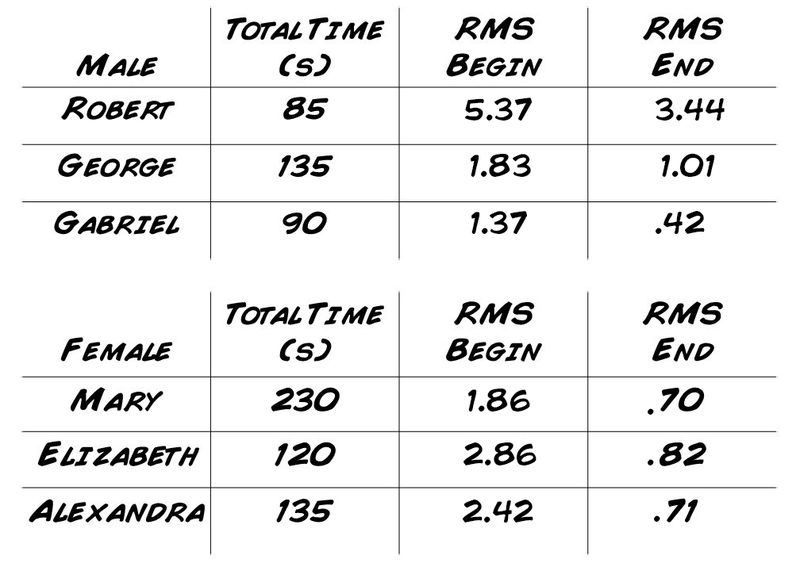 Calculating the average rates of fatigue, the women had an average rate -1.11 RMS/s, and the men came in at -1.31 RMS/s. Our preliminary data thus suggests that women may have better muscle endurance, fatiguing at a slower rate! Why would they be better at maintaining their strength over a longer period of time? Are they stronger? not necessarily, endurance isn't really about strength. Are they tougher? Certainly. Are they just flat out better in terms of muscular endurance? Maybe! Lots of research has been done into looking at this difference (example), and it has been found (by us too!) that women's endurance is often greater than men's. Where can we see this in a non-scientific setting though? Women's impressive endurance gives them an edge in rock climbing - this is a sport where it is common to see women in direct competition with men. Research is also being done into women's endurance running and it looks like men and women are on equal footing there as well! Use this example to guide your own experiments! Think about different variables you can test. You could also compare different muscles from the same body; investigate whether people's arms or legs have different rates of fatigue, or just compare left and right arms. You can compare people at a neutral state, and then at a tired or excited state. What can you come up with? 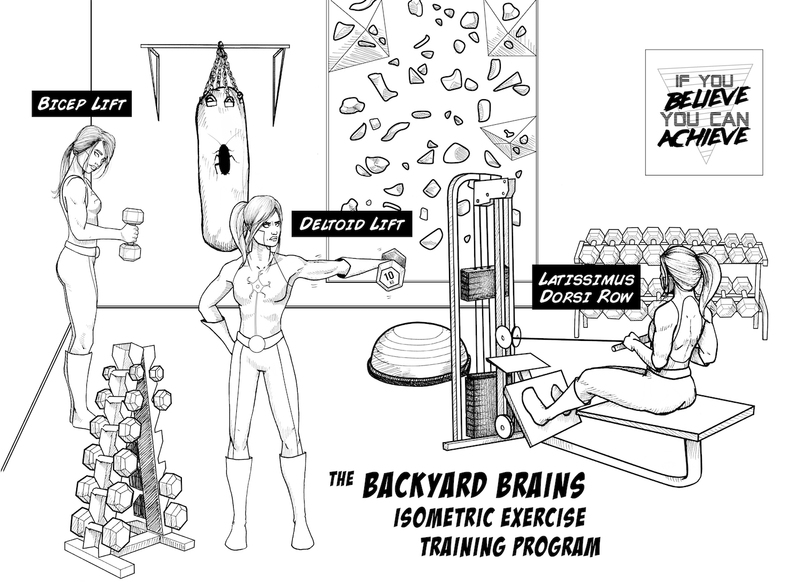 If you design an experiment and come up with some cool results, email us at hello@backyardbrains.com! and, with your permission, we'll share it on our website! You can contribute to the world's scientific knowledge! What can the slope of the trend line teach you about muscle fatigue? Think of examples where you encounter muscle fatigue in your daily life. Does it ever serve as a beneficial function? If you start hitting the gym, pumping iron, and getting fitter, what will happen to your rate of fatigue?